Gaithersburg, Maryland, USA – September 12, 2013- GL Communications Inc. announced today its single platform software solution for Emulation and Verification of Communication Protocols. Speaking to reporters, Mr. Karthik Ramalingam, Senior Manager for Product Development of the Company said, “GL's Message Automation & Protocol Simulation (MAPS™) is a protocol emulation and conformance test tool that supports a variety of protocols and it also supports all types of traffic simulation – Voice, Digits, Tones, Fax, SMS, Email, HTTP, and Mobile data traffic. He added, “GL's Message Automation & Protocol Simulation (MAPS™) being a single framework – single platform solution that significantly reduces user efforts to simulate multiple protocols / interfaces and it is a PC based solution which makes testing across any network easy and feasible. The user can also perform end-to-end QoS and call control testing from TDM-to-TDM, TDM-IP–TDM, or an All-IP network. MAPS™ also supports testing inter-working of legacy networks (such as CAS, SS7 and ISDN) with IP networks (such as SIP, MGCP, MEGACO, SIGTRAN) including UMTS, LTE, better known as 3G, and 4G respectively. With customizable protocol messages user can modify any message, message parameters, and/or information elements. Also the user can add, modify or remove any optional parameter depending on specific feature of interest and perform packet level fault insertion by impairing any bit / byte of a message. 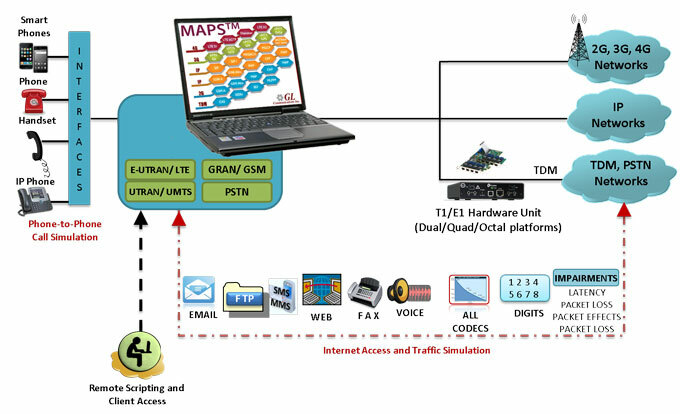 MAPS™ platform supports multiple transports for IP network (TCP, UDP and SCTP) and supports both IPv4 and Ipv6 and simulates multiple SS7 (MTP) links, LAPD Links. And it is also a useful tool to test and measure the capability of an entity for various traffic conditions. The test automation feature of the MAPS™ helps define multiple auto-handlers to an incoming message, automate the execution of the multiple calls sequentially or randomly and handle the incoming messages. With its Command Line Interface for Remote Call Control capability, user can send commands from scripting tools such as the TCL, Python and others and can control and operate remotely and gather statistics, logs and reports.